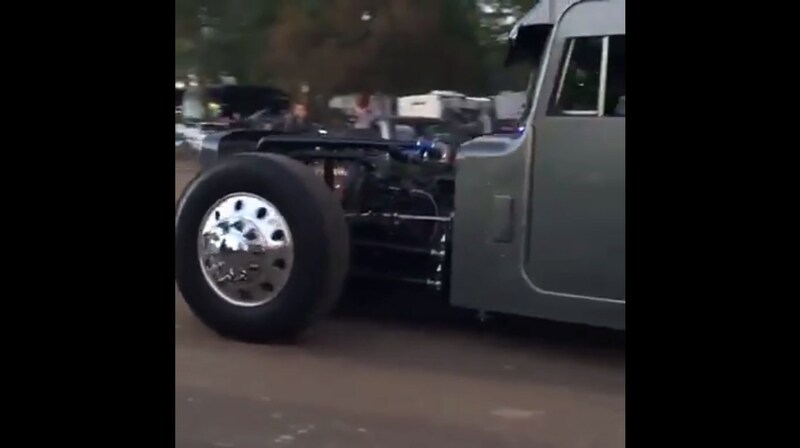 Would You Cruise Around In a HOODLESS LOWERED SEMI TRUCK?! No matter what you like, no matter what you do, there will always be people who will support you and people who will be against your choice. This also goes in the automotive world as well. It rarely happens somebody to create/modify a vehicle that is approved by everybody else. But in most of the other cases, people are divided. Those who dislike a certain ride often theorize how ugly it is, how it could`ve been better etc. As long as their comments are valid, everything is OK, but if they are talking gibberish, they are not worth spending time for them. So, what’s the case with this lowered semi truck? We wanted to express ourselves this way, because of the comments that are posted regarding the following video. Namely, in it, you are about to see a hoodless, lowered semi truck passing by the person recording the footage. Beside this lowered truck, there are also other similar vehicles that you can search for on this website! Anyhow, there are comments like “why the owner spent his money on this truck”, “I could`ve done it better” and similar. But mostly, haters are nothing but jealous. At the end of the day, people can do whatever they want with their money. Simple as that. At last, click here to see the truck that went hoodless down the highway!